As we count down to reading as a marathon sport on June 6th, let's go over a few points. More questions? Ask them in the comments. 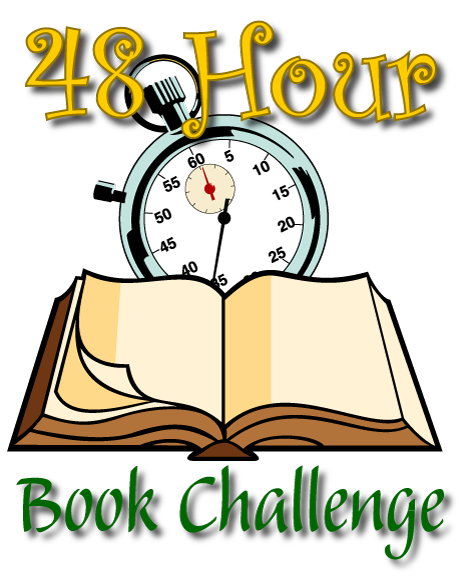 Why does the 48 Hour Book Challenge actually takes place over more hours in the weekend? With time zones, work schedules, and "having a life," a broader window of opportunity gives more people a chance to participate. I can't read the whole time because I have a wedding/graduation/recital/monster-truck rally to attend. Is that okay? Yes. Once you start your hours they are continuous, but that doesn't mean that you won't have breaks - maybe even truly significant breaks - in your time. Though I'd gently suggest that if it is your wedding, you might reassess your priorities. Like, I have a LOT going on that weekend. How can I participate? Do we have to read diverse books? I won't be policing participants' reading, but since we are not doing a readathon for monetary contribution, this is our social cause for the challenge. It is not required, but strongly encouraged. You can certainly count time reading aloud to your child. Kids can always play along for the fun of it, but no prizes are offered. However, that doesn't mean that you couldn't give your own prize to your kid. Can I count hours spent writing reviews during the 48HBC even if I schedule them to post after the challenge? That is so adorably organized. Yes, feel free to write reviews that will post later, though you might note that in your final summary. I love this idea! How can I help? Blog it. Tweet it. Share it. Tell friends. Tell frenemies. Most of all, sign up! Being part of this community event is helping in a big way.